"Using a stylus with the iPad is pretty silly! But this Wacom Bamboo Stylus might not be. Not only does it have the Wacom name behind it, but the Bamboo Stylus has a tip (6mm) that's 25% narrower than most other stylii, which should help make the Bamboo Stylus more accurate." I don't agree that using a stylus is silly, since I use a stylus frequently with my iPad when taking notes, etc. But the one I have does have a rather large tip so something like this with a narrower tip would be an improvement. This one is due to be released in May for around $30.00 USD. What are your thoughts on using a stylus, yay or nay? I will DEFINITELY be looking for this stylus when it's released. I use a stylus a lot with handwriting recognition software for taking meeting notes. And, like you, I feel that my current stylus tip is too fat. I'm not sure why somebody would blatently say that using a stylus with an iPad is silly, unless that person simply hasn't considered the various ways you can interact with the iPad or all of the many things you can do one. I agree as well! I had my Foundation purchase two iPad I w/3G to be used as credit card terminals at our events. I'm using Square for processing, and the transaction process includes a signature box for the purchaser to sign. Is all depends on what the tip is made of. The ones iwth foam rubber on the tip just disintegrate. So you end up with a $30 pencil with a broken lead and no way to sharpen it. So I am in the market for a new stylus, mostly for marking up documents that people send me. Huh, don't mind me asking, but wouldn't a cheap Android tablet with a resistive screen be a far more economical solution? I definitely want one of these. I have used Wacom in the past for windows tablets. A smaller nib is just what the doctor ordered. I haven't worn one out yet, but they've always felt pretty flimsy, as though they could fall apart at any moment. I have at least three good reasons for a stylus with the iPad. 1. Using Penultimate for handwritten notes, it produces a better looking script note than using my finger--and it feels more like writing into a mole skin note book on top of it. 2. I use Citrix to access and run my work computer remotely. I need a pointing device as I bridge into the windows world using my iPad. 3. My wifes hands seem to have significant trouble with the touch screen--until I got her a Griffin stylus. I believe the problem is the amount of hand lotion she has on her hands interfering with the touch screen technology. She has had no problems since using the stylus. I could add a fourth, if I were really an artist. I have SketchBook on the iPad. Drawing is a bit easier and more accurate with a stylus. If the Wacom stylus has a finer tip than the Griffin, I will gladly give it a try. Until then, I am very happy with the Griffin stylus. Art and note-taking are probably the 2 most common use-cases for using a stylus on the iPad. Fortunately there now seem to be a lot of good options either on the market or coming to market soon- we're not limited to the Pogo Sketch (and similar competitors) with its flimsy foam tip any more. 1. Nomad Brush- a paint brush stylus. Brilliant concept and great for painting apps. I'm not an artist at all, but bought one of these because for me it enables dabbling with art apps- using my finger was just too imprecise and clumsy. 2. Cosmonaut- a wide-grip stylus. 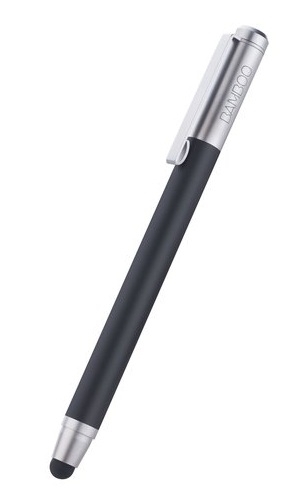 If you write on your iPad more like you write on a whiteboard with a dry-erase marker than like you write in a notebook with a pen/pencil, then this is the stylus for you. A Kickstarter project that's not yet available to the general public. I funded this one and can't wait to get mine. Stylus Socks is also an interesting approach that I'm interested in but haven't tried yet- the problem with rubber tips is the friction they generate: if your stylus doesn't glide over the screens surface then drawing/writing is impeded. That's one of the main advantages of the Nomad Brush: very little resistance. One thing to remember is that the limit of the capacitive screen to detect touches is I believe 5mm, so any tip smaller than that offers no additional accuracy and may have trouble registering the touch.